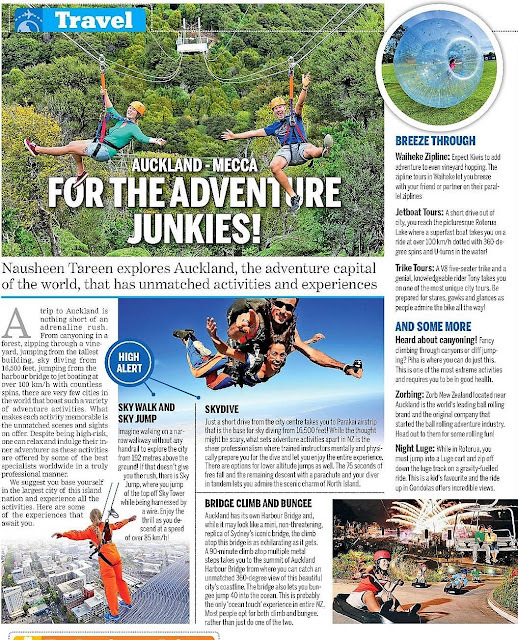 A trip to Auckland is nothing short of an adrenaline rush. From canyoning in a forest, zipping through a vineyard, jumping from the tallest building, sky diving from 16,500 feet, jumping from the city bridge to jet boating at over 100 km/h, there are very few cities in the world that boast of such a variety of adventure activities. What makes each activity memorable are the unmatched scenes and sights on offer. This heaven down under has slowly but surely emerged as the adventure capital of the world as despite being high risk, these activities are being offered by some of the best professionals in a truly professional manner. While whole of New Zealand is nothing short of a natural marvel dotted with pretty sights and adventure activities, we suggest you base yourself in the largest city of this island nation and experience all the activities. Here are some of the action packed experiences that await you in Auckland. Imagine walking on a narrow walkway without any handrail to explore the city from 192 meters above the ground! Sky walk has become an iconic city activity with tourists and celebrities sharing their images of soaking in the sights of the city with nothing more than their harness for support atop a metalling walkway. If that doesn’t give you the rush, then there is Sky Jump where people jump of the top of Sky Tower while being harnessed by a wire. Enjoy the thrill as you descend at the speed of over 85 km/h! Auckland too has its own Harbour Bridge and while it may look like a mini replica of Sydney’s iconic bridge, the climb atop this bridge is also as exhilarating as it gets. A 90 minutes climb atop multiple metal steps takes you to the summit of Auckland Harbour bridge from where you can catch an unmatched 360 degrees view of this beautiful city. The bridge also lets you bungee jump 40 meters into the ocean. This is probably the only ocean touch experience in entire NZ. Most people opt for both climb and bungee where they start the bridge climb, stop for bungee and then continue with their climb rathe that just do one of the two. Just a short drive from the city centre takes you to Parakai air strip that is the base for sky dive from 16,500 feet! While the though might be scary, but what sets adventure activities apart in NZ is the sheer professionalism where trained instructors mentally and physically prepare you for the dive and let you enjoy the entire experience than be scared through it. There are options for lower altitude jump as well, but since you have a chance of enjoying one of the highest jumps, then why not. The 75 seconds of free fall and the remaining descend with a parachute and you diver in tandem where you get to admire both the scenic charm of North Island from coast to coast has to be the most beautiful thrill you’d have experienced. A short ferry ride from Auckland takes you to picturesque Waiheke island, home to boutique vineyards and beautiful houses. Here you can enjoy wine tasting, sample amazing food at cafes or just laze around on a scenic beach. But expect Kiwis to add adventure to even vineyard hopping. 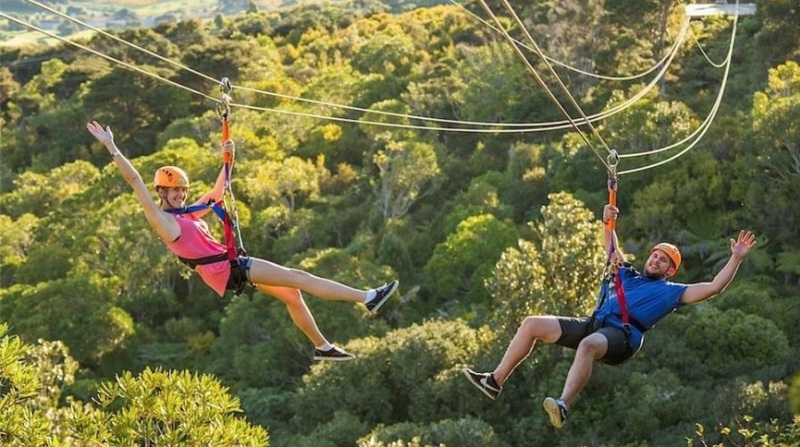 The zipline tours in Waiheke let you breeze with your friend or partner on their parallel ziplines where you get to see amazing views of vineyards and olive groves! This is literally heading out for a spin! 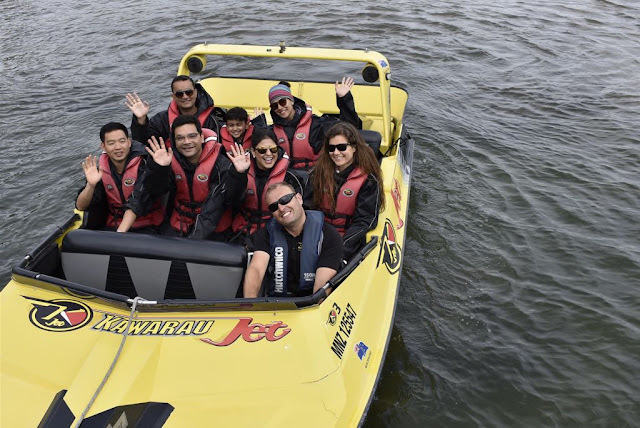 A superfast boat takes you on a ride at over 100 km/h dotted with spins and U-turns in water! All you have to do it hold on to the handrails and let the boat take you on one roller coaster experience. We opted for Mokoia Island with K-Jet tour. Located in the middle of Lake Rotorua, a short drive from Auckland, you can enjoyed the twists and turns on a boat to reach Mokoia Island, enjoy a bird walk, listen to amazing Maori fables and return to Rotorua experiencing further twists and turns. This was a chance discovery while enjoying a stroll on the Viaduct. We came across this V8 five seater trike and thought it was display vehicle. We met the knowledgeable rider Tony and realized this was one of the most unique city tours to be enjoyed. The trike takes you across the city where you have the option for either driving through the prominent city centers or breeze through the bay areas and admire the coastline. Fancy climbing through canyons or cliff jumping! A short drive from Auckland takes you to Piha where you can test your appetite for adventure with a canyoning experience. Among all the adventure activities, this is one of the most extreme and requires physical effort thus expects you to be in good health. Fancy being put in a giant plastic ball and rolled down hills and on water? Zorb New Zealand located near Auckland is the world’s leading ball rolling brand and the original company that started the ball rolling adventure industry. Head out to them for some rolling fun! While in Rotorua, you must jump into a Luge cart and zip off down the luge track on a gravity-fuelled ride. This is a kid’s favorite and the ride up in gondolas offers some incredible scenic views. Additional Info: Airline connections: Connecting flights to New Zealand are available on Singapore Airlines/Air New Zealand, Thai Airways, Cathay Pacific and Malaysia Airlines with stop-overs in their respective hubs. New Zealand’s international gateways are Auckland, Wellington, Christchurch and Queenstown.